Sennheiser Momentum M2 IEi Apple compatible In Ear Headphones - The true dimensions of the Sennheiser MOMENTUM In-Ear headphones can be measured not only by their uncompromising sound, but also in a wealth of small details – from the precise, stainless-steel sound tunnel to the three-button smart remote and mic. 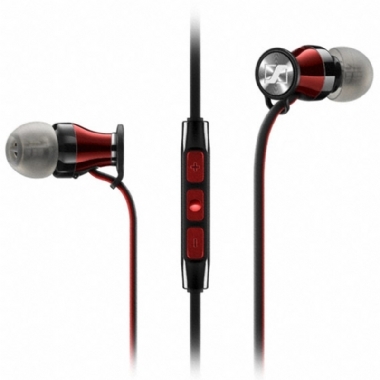 The design of the MOMENTUM In-Ear discreetly hints at something special. Over 200 contrasting red stitches grace the black-lacquered zipper on the soft-covered case that safely protects your earbuds. The black-and-red cable leads to a red, high-gloss housing. And the outstanding design also extends to their fit, with comfortable tips that sit just right. There’s only one way to deliver uncompromising sound in a small package: by combining top-quality materials with superior craftsmanship. That’s why there is no plastic to be found in the acoustic components. Instead, they are constructed from high-quality stainless steel, manufactured using precision milling technology. It’s not a difference you can see – but one you’ll hear in the powerful yet nuanced sound signature. Includes a sturdy hard-shell case, intuitive remote for iPhone, elliptical cable that minimizes tangling, gold-plated jack and integrated hands-free microphone.